It is 1985 and the cold war is still dominating the press and international relationships. People are trying to defect to America to escape prosecution. The CIA helps those who are important enough and famous enough to have an impact on the Soviet peoples. Riesling is one of the CIA's top rescue agents. On this mission, though, he will not live up to his reputation. Before he dies, he sends word via a golden snake medallion that the Grandmaster might still be alive. The Grandmaster is Justin Gilead. Gilead is a superb chess player and spy. It is believed that he had been killed four years before but this medallion implies otherwise. If Gilead is still alive, than the CIA wants to step in and help him. The Russians, especially Alexander Zharkov, feel otherwise. Zharkov and Gilead have been enemies since the second time they meet. While Zharkov was response for Gilead's death four years before, they now must have another showdown to balance the powers of good and evil. 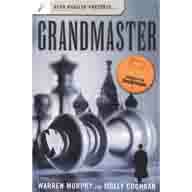 In many ways, THE GRANDMASTER is a story of good and evil rather than a thriller or mystery. Every action and character has two distinct and concrete images. Russia and Zharkov represent evil and darkness while America and Gilead represent goodness and light. These comparisons are simplistic but are true in the context of this book. I always prefer books about good and evil where the choices are not simple and the division between the two 'camps' are not so clear. The lack of subtlety and complex themes makes THE GRANDMASTER a disappointment.